The 12th Cuirassiers were part of Baron Travers 2nd Brigade of the 13th Cavalry Division belonging to Milhauds IV Reserve Cavalry Corps. At Waterloo there were 258 of them. This makes the 15 model unit in the picture a little large but adjustments can be made in the Roster sheet strength. 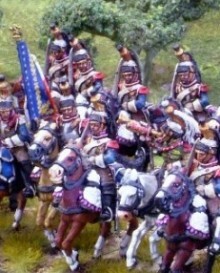 They were in reserve at Ligny and took part in Neys massive cavalry attacks at Waterloo.